With its durability and realistic wood like top surface, Gerbur Aqua Clicks-Washed Oak really is the pinnacle of today's modern flooring. 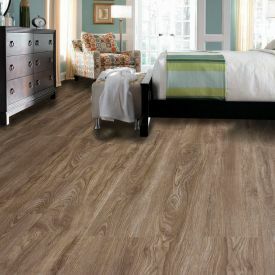 Perfect choice for those who desire the beauty of wood floors without compromising performance. Its light and most refreshing wood grains make this Oak-effect vinyl tile a smart and sophisticated choice among the Aqua-Click-Natural collection of floorings. It is equally a smart choice when it comes to value for money and minimum maintenance. In a family home, hygiene is particularly important. With these vinyl tiles unique click lock mechanism the tiles fit together without leaving any scope for bacteria and dirt to latch into the cracks.